Description • Designed for patients at risk of falling or requiring a restraint for medical treatment. 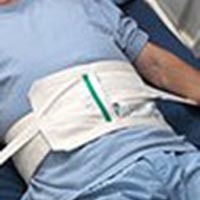 • Designed for patients at risk of falling or requiring a restraint for medical treatment. • Soft flannel body holder can be used in a bed or wheelchair. • Slot may be positioned in the front for limited movement or rear for increased movement for the patient. • Straps attach to bed frame or wheelchair tilt bars with quick-release ties.